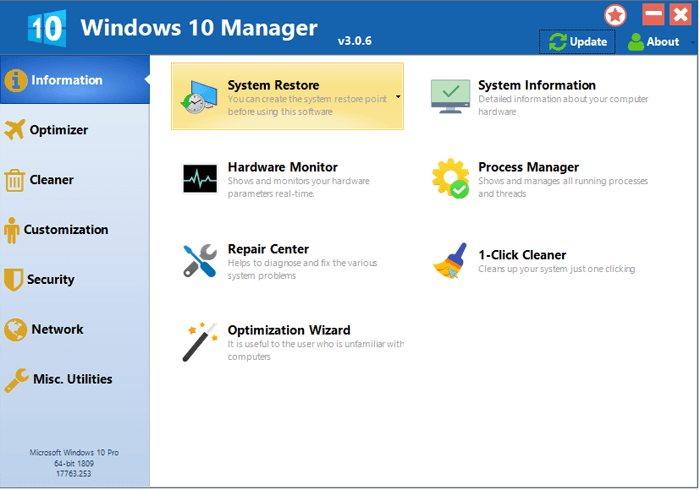 Description: Windows 10 Manager is an all-in-one utility for Microsoft Windows 10 specially, it includes over forty different utilities to optimize, tweak, clean up and fix your Windows 10, helps you make your system perform faster, eliminate system fault, increase stability and security, and personalize your copy of Windows 10. Get detailed information of soft wares, hard wares and running processes; cleans system automatically by clicking once mouse key; Repair Center fixes various system problems. Improve windows startup and shutdown speed; control what is started on Windows startup, check and repair the advanced startup items; turn off smartly some unnecessary system services and tasks to improve system performance. Find out which files or folders engross disk space and shown with chart; fully delete programs without residual information; clean junk files, duplicate files and Registry; Registry Defrag rebuilds and re-indexes Registry to reduce registry access time and improve application responsiveness. Customize the look of system by tweaking Explorer, Desktop, Taskbar and notification area; create the quick startup items on Taskbar with the Jump List launcher; tune up boot menu, edit context menus of mouse Right-Clicking; Edit the Win + X menu that shown when right-click on Desktop bottom-left corner or Win + X shortcut; create the shortcut that executed on run dialog box; change system and file type icons. Improve system security by tweaking system components, UAC and login settings; hide and restrict drives and programs, encrypt decrypt files, move system folders to safe locations; maintain your personal privacy by eliminating the tracks that you leave behind; optimize Internet connection speed, tweak Internet Explorer; Switch IP address easily on different networks. Split and merge any files; automatically back up files regularly. Windows 10 Manager has a topnotch, easy-to-use user interface. It is an excellent companion for Windows 10!